I did a little research to understand how baseball had originally earned this honor. 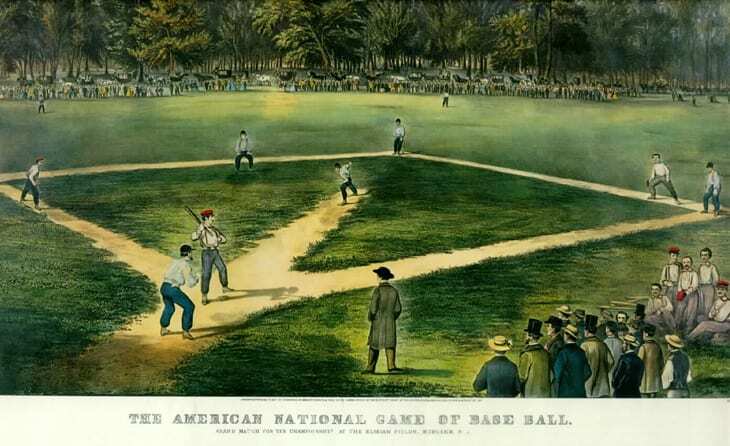 Baseball rose to popularity during and immediately after the American Civil War. Baseball was what kids played after school and adults played on weekends. There was no television, so baseball literally became America's favorite way to pass the time. Before long, baseball became the topic of choice at most dinner tables. Baseball became so commonplace, that almost everyone knew enough about the game that they could talk about it with a neighbor or a person sitting next to them on the bus. However, I conclude that in order for something to become a “national pastime” it has to be more than just America's favorite activity. It must become so intertwined with our society and culture that it just becomes a way of life. It is familiar to almost everyone, if not all. Baseball definitely meets these requirements. With this in mind, I asked again, “Is baseball still America's favorite pastime?” Some say that baseball was to the late 19th century and early 20th century as video games and television are to today. Perhaps kids today are spending more time playing video games and watching television than they are out playing baseball in the neighbor's yard. And perhaps people are discussing with the person sitting next to them on the bus more about who is going to get eliminated from Dancing With the Stars than who won the game between the Cincinnati Reds and the St. Louis Cardinals. But I do not think anyone can deny that baseball is America's longest standing “national pastime.” In a few years, Dancing With the Stars will be replaced with some other reality show and video games will be exchanged for some newer, bigger, and better technical phenomenon. But baseball will still be around. Baseball will still be baseball. People will still be going to games, eating hot dogs, and singing “Take Me Out to the Ball Game.” After all, baseball is a part of America's culture. As summer approaches, I encourage you to keep with tradition and live the American way. Get off the couch and go out and toss a ball with your child or better yet take the whole family to the ballgame.